Mix and rise at room temp for 12 to 16 hours. Mix everything except for salt, autolyse for 40 min. Add salt and knead in a KitchenAid type mixer at medium speed for 4 minutes. Bulk rise at room temp (~78F) for about 2.5hrs, with stretch and fold at 30, 60, and 90 minutes. Pre-shape into a ball, let the dough rest for 10 minutes, then shape and place in a floured banneton for the final rise. Proof until the dough springs back slowly when pressed. It took me 2 hours and 20 minutes. Bake at 450F for 40 to 45 minutes, the first 25 minutes with steam. Let it cool completely on a rack before slicing. Comments: This is a bread that screams for a bowl of chili, and that is exactly what I made on a Sunday afternoon. I used our favorite recipe that simmers on the stove top for hours, but we did not touch it until next day. 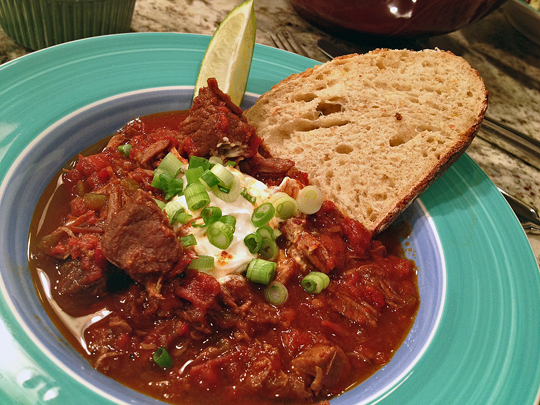 That chili is good on the day it is made, but it turns into spectacular the day after. Plus, what can be better than arriving home from work on a chilly Monday, and have dinner basically ready and waiting for you? TxFarmer description of this baby was spot on, by the way. The orange gives it a slight hint of sweetness, but the sourdough character of this bread is there. The cumin is the touch of genius that makes this loaf superb with a bowl of chili or any type of spicy stew. I could not have chosen a better loaf to inaugurate our Supernova! what a beautiful bread! Orange, it sounds like x-mas!! Can you tell me please, what is “bread flour”? Is it made from rye or wheat or both? We don’t know this in Germany.. Bread flour is just a white flour with a slight higher gluten content – 13%, sometimes even 15%, but those are usually better to make bagels that require a lot of gluten for proper structure. That’s a fantastic looking loaf of bread, Sally. In the past, I’ve tried baking with rye and was never pleased with the results. Maybe it’s time I try again, especially if the loaf has this flavor profile. Cumin and orange sound really good! The orange note of the bread would tempt me to smear some cream cheese or some softened butter on a slice and just enjoy it on its own. Cumin and orange…what an itneresting flavor pairing for bread!! I’ve got the bread baking bug back after seeing this! Cumin and orange… scones? Could that work too? This bread loaf should be shipped to me, Sally! 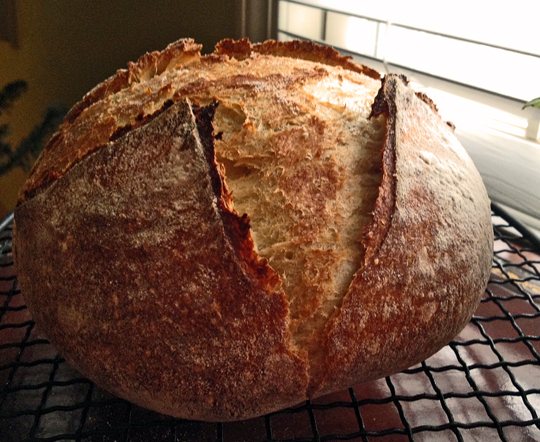 🙂 I am a fan of sourdough… and with orange and cumin, what an exciting flavor profile. You know if I could I would personally deliver it, right? But to be completely honest, I would pass out from hyperventilation if I had to bake a loaf for you! Oh dear! This looks beautiful and appetizing and I too love the orange and cumin!! . . . Hmm, and there I did order a sourdough starter from the US as Celia suggested quite some time ago, and I hate to think where at the back of the fridge it is now situated 🙂 ! Useless. Well, ’tis time for New Year resolutions, isn’t it 😉 ! Sourdoughs can endure a lot of abuse, but if you think yours is beyond recovery… order another one! 😉 Enabler, who? Me? Wow, I think you have bread baking down to a science! I get a bit intimidated by the use of a “starter” or keeping one alive. I’ve made bread making a simple, one time starter, and I know that it makes a huge difference in my bread baking. I love the touch of orange in this, very Sicilian, as my dad seemed to add a bit of orange into many things! What a gorgeous loaf! I haven’t baked a loaf since last winter, and I am itching to get back to it! I think my poor starter needs some major TLC before that happens. Your loaf looks great, love the combo of cumin and orange! 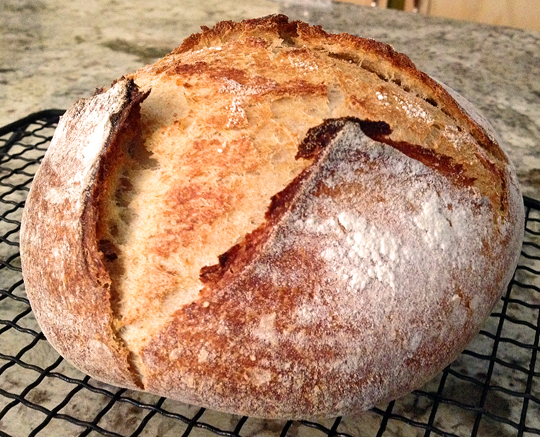 Oh, I can imagine you miss your sourdough adventures… but you’ve got much more wonderful things to take care of! 😉 Baking can wait…. Oh my gosh, Sally, what a gorgeous loaf of bread! It looks just fantastic. I’m pinning it right now to make. I haven’t made any bread in awhile, and this one is calling my name. Happy Holidays! Oh my goodness…I can smell it and taste it from here! What a glorious loaf of bread. It’s 5am here and this would be lovely sitting in front of me right now. This bread looks and sounds stunning! Love the orange-cumin twist too! Oh my goodness! This is one gorgeous loaf Sally! Ok, I found an extra copy of the sour dough cook book, so how do I send it to you? By the way, I’ll be out of town for a couple weeks so it might take me a while to get it sent off. Hi, what cookbook are you talking about??? ?